The last of our three RiLIES projects focus groups took place at The Sixth International Evidence Based Library and Information Practice conference (EBLIP6) in Salford on Tuesday last week. 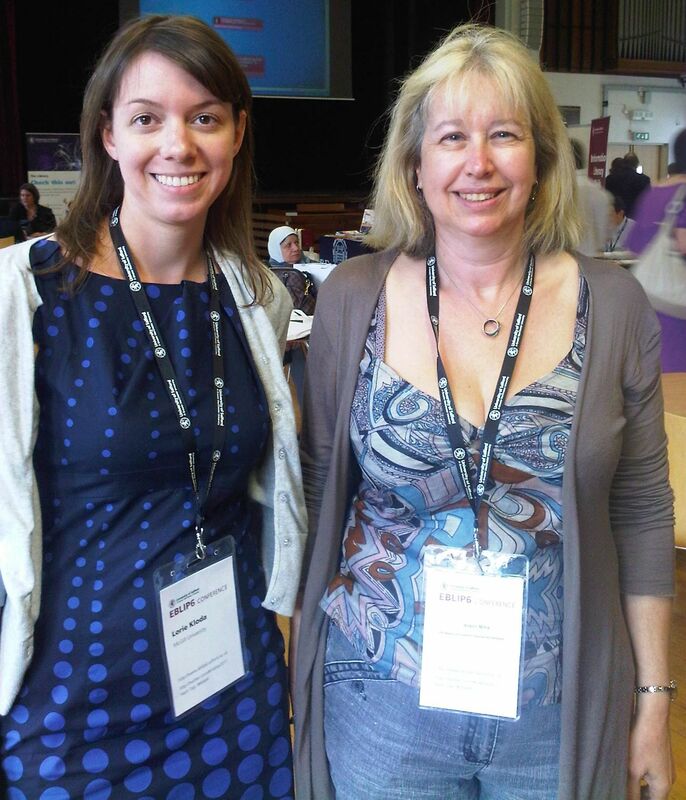 This was kindly organised with the help of Alison Brettle and Maria Grant, the conference chairs of EBLIP6. Once again the RiLIES project team members enjoyed the conversations with LIS practitioners, this time with those working in the health and medical sectors. On this occasion Ella Taylor-Smith facilitated the discussion, with Jenny Gebel and Hazel Hall in attendance. As has been the case with the other focus groups, the conversation kicked off with initial reactions to the broad research question of the RiLIES project: “To what extent does the output of UK funded librarianship research projects influence the practice of librarianship?” The main themes that emerged from the discussion were: the levels of engagement with research that this community enjoys; the comparative value of traditional textual publications in librarianship and medicine/healthcare as sources of information on research of relevance to the practice of librarianship; the use of electronic sources to raise awareness of research; and opportunities for face-to-face information and knowledge sharing. The data collected will be analysed in full with that collected from the focus groups earlier this month with public librarians in Perth and academic librarians in London. Further updates about the RiLIES project will continue to be tweeted from @LIS_RiLIES. There is still an opportunity for LIS practitioners across all sectors to contribute further by telling us if, and how, they have used the output of any of the five case study projects identified for this study. We will also be distributing a final survey in the next few days, so please look out for this. Professor Hazel Hall opened the final day of EBLIP6 in Salford with a thought-provoking keynote speech on impact. Both patrons and managers demand services that really make a difference, and impact may take different forms: from changing users’ information behaviours to assessing academic impact through bibliometric measures, or evaluating services based on specific outcome measures, especially in the academic sector. Also, impact is very difficult to measure and evaluate. The impact of research on practice, for example, is often dependent on the cumulative and indirect effect of practitioners’ exposure to research output. Impact counts, anyway! In the current economic climate, research must demonstrate that it actually has an impact on practice, and the research–practice gap should be bridged, or at least reduced. Hazel then shared with the audience evidence emerging from the LIS Research Coalition’s RiLIES project which is due to report later this year. Several factors play a key role in increasing research uptake by practitioners: quality, scale and applicability of research itself; means of face-to-face dissemination; availability of accessible textual sources to be used as a reference in daily practice; high profile dissemination partners; and – last but not least – individuals who act as research connectors, as well as social media. Hazel finished her presentation by referring to the question “What difference does it make?” appropriately citing the Smiths, whose Salford Lads’ Club photograph is now one of the most iconic in British music history. Later in the morning, parallel section 6 focused on a range of topics: (1) web-based services to enhance users’ experience of library services; (2) analysis of electronic resources usage by patrons as a key indicator of value generated by academic library services; (3) the development of evidence-based services in academic and health libraries, and their impact on quality improvement. As budgets shrink and patrons’ expectations rise, all three sessions offered really useful tools to improve service provision and demonstrate value for money. The session before lunch showed an innovative and interactive format: the LIS Research Coalition organised a panel session involving LIS practitioners and journal editors. The session aimed to improve communication between the two parties and help information professionals plan the publication of their work with a better understanding of the goals and practical steps involved in editorial processes. For example, the editors advised the careful project-management of any potential publication, paying close attention to the information needs of the target journal’s audience, and not to underestimate the value of what professionals have to say to their colleagues and peers. Aiming for a high standard of work is important, but the editors encouraged members of the audience not to be obsessed with perfection: peer reviewers can help improve the quality of work submitted with their feedback. Importantly, the peer review process should be viewed as a dialogue during which both parties have a potential to learn. Also worth emphasising was the difference between research and practice-based articles: there are specific LIS journals for both categories. Even negative results, which are rarely published, are of great interest to audiences. After a refreshing lunch and a final look at the posters (of amazing variety and really high quality), delegates were ready for the last two sessions of the conference. Parallel session 7 engaged the audience on a wide array of issues related to innovation and development of services, including the role of libraries in the management of scientific datasets, performance measurement techniques such as activities-based costing, methodological reflections on best practices and the uptake of an evidence-based approach in library services, and the available evidence base for evaluating the effectiveness of web 2.0 services. A specific session gauged the progress of evidence based practice in the health sector. Here topics included the value of services offered by NHS libraries, the efficient use of bibliographic databases and the impact of clinical librarianship on patient care and organizational objectives. Then the time came for the closing address by Andrew Booth, who underlined the multidimensional and complex nature of “evidence-based library and information practice”. Virtually all the vocabulary used in the label can be discussed and modified, and the EBLIP6 conference had proved a valuable forum for the concepts to be discussed. Andrew also pondered the future of EBLIP. One key development resides in focusing less on research and randomised controlled trials and more on more on what really needs to be done to improve users’ experience in a really messy world. Andrew referred to the concept of “knowledge interaction”, which accounts for the need for genuine partnership between actors. Picking up on previous speakers’ references to music (keynotes Dr Ross Todd and Professor Hazel Hall had cited Bjork and the Smiths respectively) Andrew recited his own version of the lyrics of the Go-Go’s “My lips are sealed” to close the formal programme. Then awards were conferred and votes of thanks given. Mary Dunne was judged to have presented the best poster, and Kate Davies and Zaana Howard the best paper. Finally it was “Goodbye Salford” after a very interesting and stimulating three days. The first of our EBLIP6 reviews is by Alison Millis, Training and Outreach Manager, Library and Knowledge Services, Maidstone and Tunbridge Wells NHS Trust, @alisonmillis. 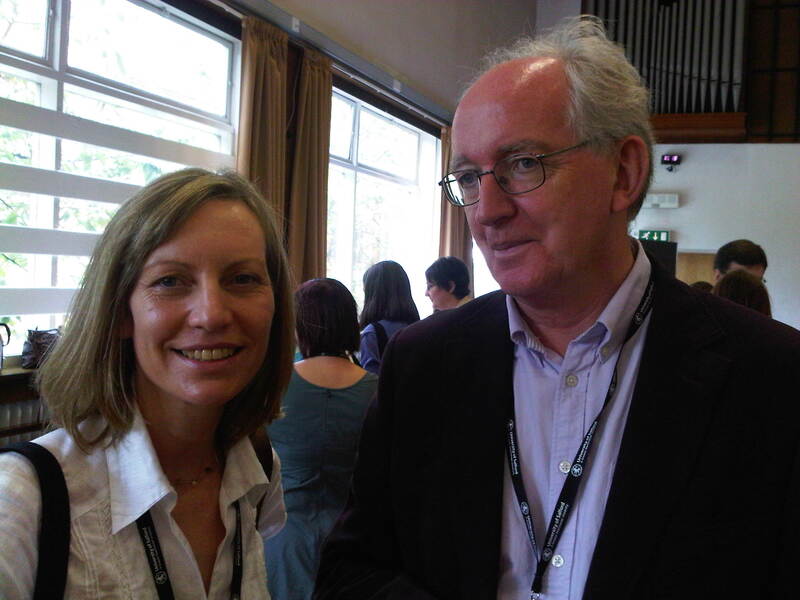 Alison reports on a pre-conference workshop on critical appraisal. The workshop was led by Lorie Kloda (@loriekloda). Lorie has taught evidence based medicine for the last ten years. She is Associate Librarian at McGill University, Montreal, and an Associate Editor of EBLIP Journal. Lorie’s session on critical appraisal took place on one of the hottest days of the year so far – tropical temperatures for a hot topic! Lorie said that her challenge in preparing the session had been to find a paper that was short enough to be critically appraised in the limited time available, but she managed to do so. 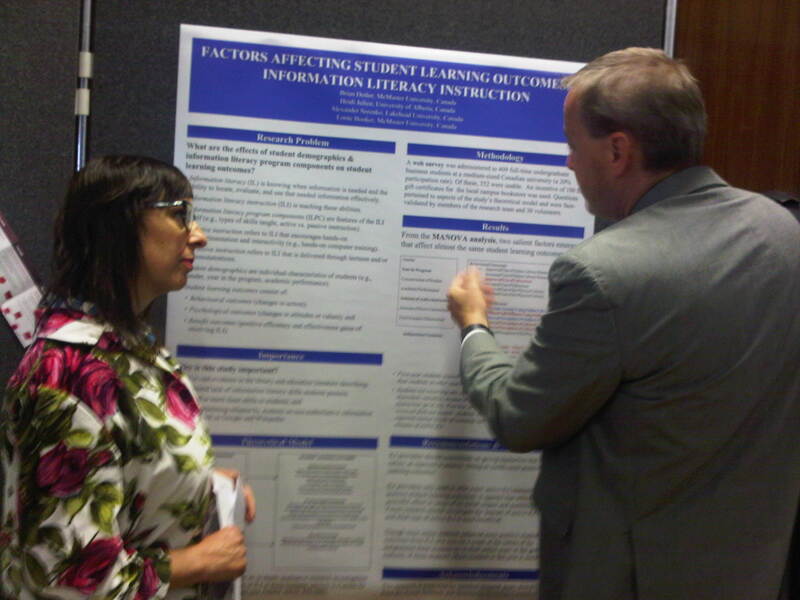 The paper chosen was “Do clickers improve library instruction? Lock in your answers now” by Emily Dill. Each area had a series of questions to be answered. This is a checklist, which was not familiar to all participating, proved to be an effective tool. The participants then worked in four groups, each concentrating on one of the four areas listed above. Each group had the opportunity to give feedback on their area, and this provoked some interesting discussions. Finally Lorie recommended two key short cuts for appraisal when time is short. These were to (1) start at the end and (2) work backwards. This technique comprises checking the results and findings to see if they are relevant and applicable to practice, then continuing with the evaluation of the paper, followed by an examination of the method deployed in the study, and finally a reading of the paper in its entirety. It was also possible for the last of the RiLIES project focus groups with librarians working in medicine and healthcare to be scheduled to take place at the conference. The four winners of the sponsored places are reporting on each of the four days. Their reviews will be posted to this blog over the course of the week. Last month team members working on the Research in Librarianship Impact Evaluation Study (RiLIES) responded to a request for information from freelance journalist Debby Raven. Debby was preparing an article on evidence-based librarianship in CILIP Update with Gazette. This article has now been published, and provides an interesting review of some of the current thinking on evidence based librarianship from key advocates of the approach in the UK. If you’re a member of CILIP you can click through to the June 2011 issue of CILIP Update with Gazette to read Debby’s article online. The article also previews the sixth Evidence Based Library and Information Practice (EBLIP6) conference which takes place at the University of Salford, 27-30 June 2011. The LIS Research Coalition is one of the sponsors of EBLIP6. The Coalition has organised a panel session on publishing entitled “Meet the editors” as part of the conference programme on Thursday 30 June, and funded four places for UK delegates at the event. Professor Hazel Hall is delivering a keynote presentation at the conference, and chairing one of the sessions. On the Tuesday the Research in Librarianship Impact Evaluation Study (RiLIES) project team will be in Salford to run the third of the RiLIES project focus groups with librarians working in medicine and healthcare. If you are unable to attend sixth Evidence Based Library and Information Practice (EBLIP6) conference in person, you can follow it remotely by tracking the conference Twitter hashtag #eblip6. There is also the option of remote registration with access to streaming and recorded video (for a fee), the details of which are given on the conference FAQ page. The Sixth Evidence Based Library and Information Practice (EBLIP6) Conference takes place from June 27th until June 30th at the University of Salford. In a blog posting of March 30th 2011 we reported that the LIS Research Coalition is sponsoring part of the programme with a panel session entitled “Meet the editors” on Thursday 30th June. We are now pleased to introduce the panel members at the session and preview the discussion. “I am the Editor-in-Chief of the journal Evidence Based Library and Information Practice, which is a relatively new open access journal. We publish quarterly, and have an extensive network of LIS volunteers from around the world who contribute to the journal’s success. “Library and Information Research covers a broad field and attracts submissions from all sectors and parts of the globe. We are particularly keen to publish research that is accessible to, and usable by, the LIS community and to encourage new authors to write for publication. “As a practitioner myself, I know that the day job is often so busy that the thought of “doing research” is just one extra chore. As an editor, I know equally that where librarians have conducted research projects, they have derived enormous benefits at both personal and professional level. Many of us conduct research on an everyday basis without seemingly recognising the fact: we do original and innovative things in our working lives but we don’t tell anybody about it. I’d like to set the record straight! “I am interested in how useful theories, concepts, models, frameworks and philosophies are to practitioner thinking about evidence-based practice. Which philosophical perspective – or view on the truth (if any) – is helpful and illuminating? In what respects is communication with people from different disciplinary backgrounds difficult? “We live in an increasingly demanding world of work, and a world where there is steady progress towards open access academic publishing. As an editor I would be interested to hear what potential authors think editors and publishers do well, what we do not do well, and what the community would like us to do. “Business Information Review (BIR) is a quarterly journal focused on information provision and management within organisations. “Whilst many business information professionals and librarians are still involved with published information – its supply to the desktop, skills for users, research and analysis services – the range of professional activities has expanded. BIR seeks to provide insights across the full range of organizational information activities whilst retaining a keen interest in business information resources. “BIR content is written by information professionals, content, technology and service suppliers, academics and researchers, and leading thinkers from within and outside the information world. Its international readership and authorship covers the corporate sector, consultancies and law firms, publishers and information providers, government and other public institutions, academia, and the third sector.